There’s never been a better time to be a marketer. We’ve got access to tools our forebears would hardly believe, levels of data that allow for finer and finer resolution, while every day exciting new ways to connect with our audiences are devised. 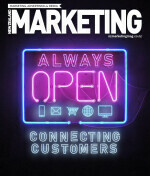 It is into this rapid evolution and re-invention that marketing’s enduring functions become all the more important. To see beyond the how and solve for the why. Our own why. To determine our success for the future by defining it for ourselves, and not by simply keeping pace with it. Longer term strategies need patience, bravery but also vision. To see beyond the next financial year, but also beyond the lure of letting “because we can” become our strategy by default. To use the available means to our own ends, and not let the means become our master. As a committee we are continuing to rebalance the Effies towards an emphasis on long-term thinking, long-term strategies and long-term success. Those strategies and ideas that payback business but also pay it forward. Of course, we need to continually have an eye to the approaches that answer short-term problems, opportunistic ideas that can steal a lead, open new possibilities and capture available value in the market. Does this rebalancing mean “big” activity will rule? Not so. Rather, in all actions we should be guided by a bigger ambition and broader intent for our businesses. Long-term success and ROI shouldn’t be at odds with each other, but often the most available evidence of success is from short-term measures – indeed showing success in the long run is a challenge in of itself. Long-term measurement requires investment of its own, strategies of its own, together with more subtle and informed analysis. To allow for this, we are creating a new structure to the results sections in most papers. Here we will allow for ROI and evidence of long-term success. We’re also introducing a short-term success paper so we can celebrate the smarts and savvy that go into winning the day. Brands and the ideas that power them are business assets. They require vision to be built, they need to be deliberately maintained, jealously guarded, and leveraged with care. The value of these assets payback over many years to come. We look forward to another year celebrating world-class thinking from New Zealand, sharing in the fierce and friendly competition of the industry that results in enduring advantage for our businesses and continue eminence of New Zealand in the world of marketing. Best of luck with your entry. David McIndoe is the head of strategy at Saatchi & Saatchi and convenor for the 2018 Effie Awards. This piece was originally published on the Commercial Communications Council's website.